Castlevania And Metal Gear Solid 4 Get A PS3 Bundle... Together! Konami has already released a special PS3 bundle for Metal Gear Solid 4. This new bundle isn't so special. 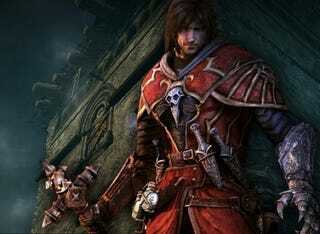 But hey, it's got Castlevania: Lords of Shadow. The PS3 bundle includes a copy of Castlevania: Lords of Shadow, a "best" or budget version of stealth game MGS4 and a Charcoal Black 160GB PlayStation 3. So that's a plain, regular old PS3 console and not some fancy PS3 created just for Castlevania. That's a shame. Previously, MGS4 got a "Gun Metal" colored PS3 to mark the game's launch. Both games are published by Tokyo-based Konami. Metal Gear Solid 4 was released in Japan in summer 2008 and is one of the biggest-selling PS3 titles in Japan. According to Konami, this new bundle will hit on December 16 and is priced at ¥37980 (US$471).